Will we have breakfast at 7? Will you take your ball tomorrow? 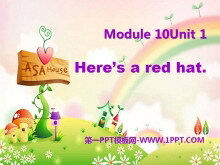 Are there many children in your class? How many apples are there in the box? Were you on the second floor? Does your mum go to work on Saturdays? What do you do on Sundays? What does Lingling have at school? Has Amy got a bike? 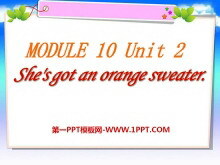 《She's got an orange sweater》PPT课件3 dress，dress 连衣裙 连衣裙dress 真漂亮。 coat，coat 是外套， 外套coat 秋天穿。 Tshirt，Tshirt 是T恤， T恤 Tshirt，夏天穿。 sweater，sweater 是毛衣 毛衣 sweater真温暖。 ha..
《She's got an orange sweater》PPT课件2 Look and say! 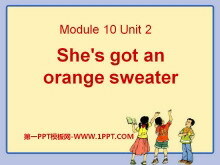 a blue skirt brown trousers an orange sweater a green sweater a white shirt She's got an orange sweater. She's got a blue skirt. She's got a pink shirt. 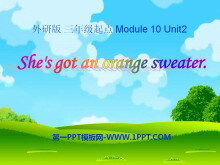 She..
《She's got an orange sweater》PPT课件 have got has got 都是拥有的意思 I've got =I have got have got 适用于第一人称（I we)、第二人称(you)和第三人称复数（They 和两个人以上 ） He's got=He has got She's got= She h..
《Here's a red hat》PPT课件4 Look at the blackboard please. Come back my little sheep. Amy: ____ the box. Lets ___ ___ funny clothes for the party. Sam: Ok. What ______have we got? Amy: Look! 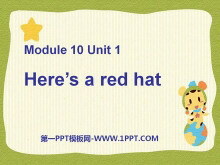 Heres a red____. 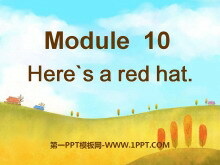 S..
《Here's a red hat》PPT课件3 Are you ready? Ive got a ____________. Homework: 1）读3遍课文并且背诵，家长签字。 2）抄写圈出的重点单词，四英一中。 关键词：《Here's a red hat》教学课件，外研版三起点三年级下册英语..
《Here's a red hat》PPT课件2 Phonics practice(1). purple turn sunny funny phone photo but bus put bed let lets art part party bird T-shirt shirt Phonics practice(2). 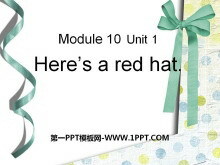 skate skip T-shirt shirt bird bag black tree..
《Has Amy got a bike?》PPT课件3 New words by 乘坐，以的方式 bike 自行车 bus 公共汽车 walk 步行 car 汽车 she has got a book. 她有一本书。 Sam has got a pencil. 山姆有一支铅笔。 Lingling has got a pen. 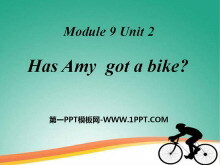 玲玲有一支..
《Has Amy got a bike?》PPT课件 Ive got a new book. Its about animals. Its a good book. Have you got a book tooDaming. YesI have. Look its about sports. Its a nice book. Have you got a new book Amy? NoI havent. 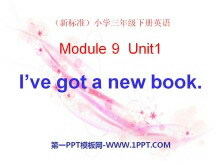 ..
《I've got a new book》PPT课件5 Chant! 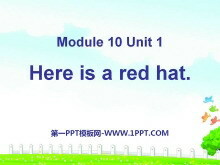 dress dress 连衣裙 连衣裙 dress 真好看。 coat coat 是外套 外套 coat 秋天穿。 T-shirt T-shirt 是T恤 T恤T-shirt 夏天穿。 sweater sweater是毛衣 毛衣 sweater真温暖。 Ive got a..